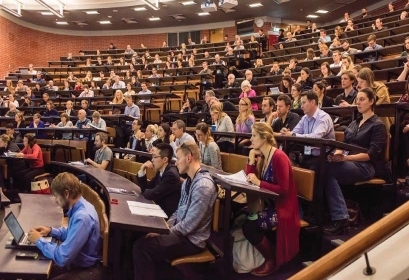 This year’s annual AMSA conference was held in combination with the New Zealand Marine Sciences Society (NZMSS) in Wellington, New Zealand. This marvellous exhibition of trans-Tasman cooperation occurs once every four years, and this year was my first chance to attend. The conference was well- attended, with several hundred delegates; 60 of these were AMSA members who had crossed the Tasman (and, in a few cases, the Nullarbor as well!) to represent Australia in a collaborative exhibition of marine science. I’d never been to Wellington. I was informed by various Kiwi friends that it was “like Melbourne, but windier, and with better coffee.” Bold claims! I thought. They neglected to mention – as I climbed the apparent 42 flights from the door of my hotel to the auditorium at the lovely Kelburn Campus of the Victoria University of Wellington (we can thank my Fitbit for this information) – that Wellington is not only windier, but mostly vertical (see attached pictures). I therefore would like to note that, not only did I come away from the conference with a greater understanding of New Zealand marine science, but with thighs of steel (an informal survey of other conference attendees confirms that this is a widespread experience). The weather was relatively mild, and the glorious vistas made for an excellent backdrop to what is honestly one of the most enjoyable conferences I have ever attended. This was no doubt assisted by the very sensible decision to have coffee available throughout the entire day (New Zealand and Australia align well on a number of significant issues, I note), and the wonderful and delicious catering provided between every session. Never would a conference attendee go hungry or without a necessary caffeine hit! Apart from one or two of the ubiquitous AV issues, the schedule went without a hitch. Although the PEP talks premiered at the AMSA 2015 conference in Geelong did not make an appearance across the pond in that particular format, there were also some excellent speed talks; this proved to be a popular and successful option. 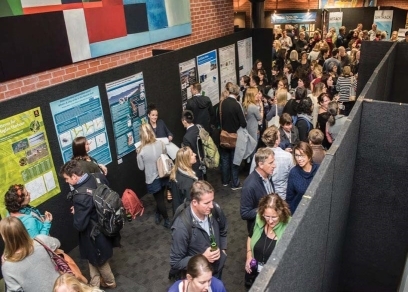 Deciding which session to attend was as difficult as it ever is with an AMSA conference: presentations were of an extremely high quality all around – there were over 200 of them over the four days (not to mention over forty posters). The judging of AMSA student prizes was incredibly difficult as a result (and much spirited behind-the-scenes debate was entered into; I hear that NZMSS prizes were similarly difficult to assign). In this very issue of the Bulletin, you can read the biographies of our deserving student winners. Speaking of spirited debate, the fisheries panel was apparently not only well-attended, but stimulated a great deal of necessary discussion (I say “apparently” as I was giving my own presentation at the time, but by all reports it was very exciting). For me personally, one of the most inspiring sessions was the Indigenous Science session on the very first day, showcasing the high quality of communication between marine science research and local indigenous communities, particularly in New Zealand. Proper integration in research activities involves not only acknowledging the stake of indigenous communities in their local marine environment but actively involving communities and their knowledge in research activities. The session also raised the profile of similar Australian programs, which certainly deserve more widespread acclaim; this is an area where a great deal of additional work needs to be done, and it can only be of benefit to the researchers, the community, and the marine environment itself. Seven exceptional plenary speakers brought their expertise to the conference, covering a wide range of relevant topics, from Rawiri Smith’s opening plenary on the role of Maori participation in New Zealand marine science and policy, to Lionel Carter’s explanation of sub-sea pipeline processes, to AMSA Jubilee Award winner Barry Bruce’s demystification of encounters between humans and white sharks and their likely encounters. I would also be remiss not to mention Lesley Clementson, who took home the AMSA Technical Award and gave a marvellous and inspiring acceptance speech at the gala dinner. This does, of course, bring us to the dinner. NZMSS hosted the gala dinner at the beautiful Te Papa Museum in Wellington. The opening performance was marvellous and the food was excellent, with a particular hat tip going to the dessert plate, which not only included enough sugar to send one spiralling happily into a coma, but cleverly constructed some of this sugar into the shape of (unexpectedly delicious) New Zealand icons! The much-coveted Sherwood Award went to recent past AMSA president Tim Lynch, although the competition was extremely stiff. 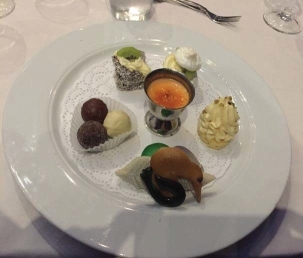 NZMSS had their own equivalent gala dinner prize – the best marine-themed hat prize – although the winner, at this time, remains a mystery (I presume this strategy is designed to thwart excitable paparazzi). The dancing continued well into the night, and the aptly-named “Post-Dinner Healing Breakfast” the next morning was well-appreciated (not to mention the late start – very considerate). Overall, I would have to say that the combined AMSA-NZMSS conference was a triumphant success. The quality of the science and communication was excellent; opportunities for enthusiastic international collaboration were everywhere in evidence; and the true strength of AMSA as a scientific body, the presence of interdisciplinary discussion and networking, was as apparent as it always is. The New Zealand Marine Sciences Society was warmly welcoming and highly efficient, and I look forward to showing them the same quality of hospitality back in Australia when we next co-host in 2020. The handbook of program and abstracts is available to AMSA members after the conference.